Where in the world is JPR? Everest - 2009 - Greeting to Cytometry community from JPR on Vimeo. Summit-Everest- Purdue (large) from JPR on Vimeo. Message to my family from the summit of Everest from JPR on Vimeo. 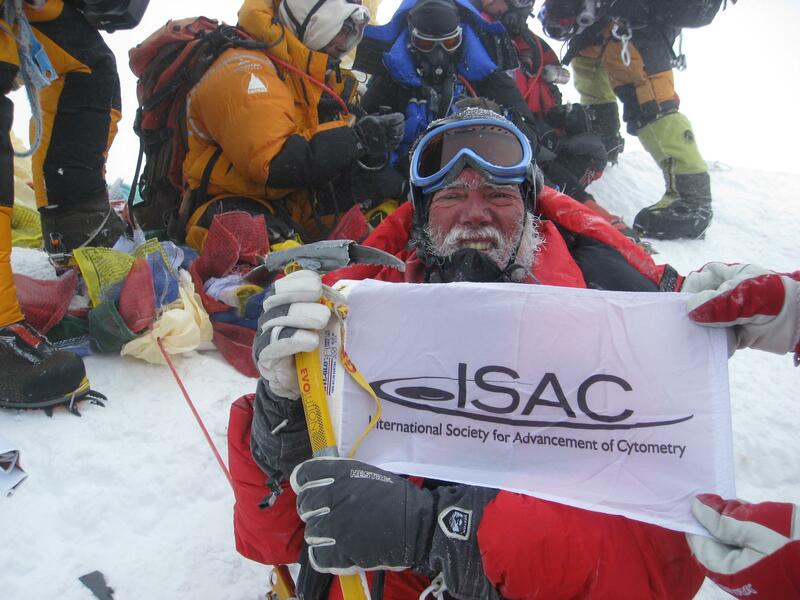 Paul climbed Mount Everest with the team from Himalayan Experience led by Russell Brice. He summited on May 23 at about 9:31am. You can view a description and the itinerary for the expedition here. You can also read the current Everest expedition newsletter and sign up to receive newsletters. Paul's blog is updated occasionally. You can monitor the progress of the team through the blog of Bruce Parker, who has climbed Manaslu with Paul, or the blogs of the other team members. Today will be last shopping in the thousands of shops in Tamel district of Kathmandu and at 4 pm we will leave the hotel for the airport. I suspect this will be the last addition to this blog, although when I return I will review all the equipment I used and give it a rating. I will also add lots of new photos and many short video I took. Thanks to all of you who have monitored this journey. I hope it has inspired some of you to try some new and perhaps difficult things. For others, I hope that I have challenged you to contribute to our Cytometry-for-life Project. Today I managed to get out of bed late (a la stomach) and walked to the NWA office and changed my flight tickets. They only take cash here for such things - amazing really. Anyway, it took 90 minutes to change, but I am on a flight out of here at 7:10 pm on June 1st. I found out today that tomorrow is a national strike day - whatever that means! After 60 days of an expedition, believe me, it is really time to get back to normal life. It has been an amazing experience - something that is hard to describe really. Clearly you have to go through a lot of hard and difficult times to reach some goals. This was one where the road was rough and tough and very, very long. You don't climb Everest in a week! Frankly, it still has not hit me that I managed to summit the highest mountain in the world. It just happened and hopefully in a while, the impact of this incredibly hard journey will hit me. Today at 6 am we were all at the Lukla airport eager to get back to Kathmandu. The flight arrived on time and a lucky 15 (including me) got onto the first flight. It literally took 10 minutes for them to unload the flight and load us on. We landed in Kathmandu about 45 minutes later and went to the Tibet Hotel. Today I had a full breakfast in Lukla before leaving and a full breakfast at the Hotel when we arrived in Kathmandu. Then we went to Mikes Cafe and had another full breakfast. In the evening we went to a nice restaurant and had some very rich food. Well not surprisingly, I suffered from overeating with a very distended stomach. It had shrunk so much, that eating all this good rich food was too much and most the night and next day I suffered miserably! Today we will walk about 6 or 7 hours to Lukla where we hope the weather improves by tomorrow as our flights are scheduled for 30th of May to Kathmandu. It was rainy and foggy all day. One good thing is that it was not too sunny, but the bad thing is that we are now almost in the monsoon season and so this affects flights into Lukla. We have heard that there are many teams stuck in Lukla waiting for space on flights. Each plane only holds about 20 people. We have guaranteed space only if flights actually fly on May 30. If not, we join the long queue and we wait in Lukla. Some groups have had to wait a week in Lukla - lets hope we don't! My flights from Kathmandu are due out on June 7. If we make it to Kathmandu on 30th, I will definitely see if I can leave earlier. It's time to go home! Lukla Airport - Nepal - Going home.... from J Rob on Vimeo. We left at 8am from Pangboche to go to the famous Namche Bazzar (3440 m). We were told this would take at least 5-6 hours but most of us did it in 4. The only problem with todays walk is that twice we have to descend to the river, cross it and then climb up again. First to the famous Tengboche Monastry then back down to the river and up a 2200 foot hill that eventually winds its way to Namche Bazar. We were supposed to have lunch at a small inn on the way, but we were there so early (too many red blood cells, so we walked very fast up the hills) that we decided to wait till we got to the "Everest Bakery" at Namche. Well, when we got there, we ordered everything on the menu and I think most of the 8 or so that arrived together ate an equivalent of 2 days food over about a 2 hour period. It was truly fantastic! Tonight we stay at the Alpine Lodge where we stayed on our forward journey. Tomorrow we have to have our bags packed and at the front door for the porters by 6:30 am. Today the sun came out. Frankly I did not believe my eyes as we are supposed to leave Base Camp today for the 65 km walk to Lukla! Well, I spent the first hour or so from 6 am packing my drum and my bag and my backpack. By 8 am all my stuff was in front of the cooks tent and there were about 20 porters ready to carry our large bags to Lula. We left the camp at 9 am and walked for 3 hours in heavy snow and eventually total slush - frequently 4-6 inches of absolute slush mixed with yak dung - really delightful stuff. When we arrived at our Lobuche Base camp (4910 m) Tashi our chef was waiting for us. They had left 2 tents up and one was the dining tent - we had a delicious lunch and within 20 minutes moved on. Today we determined we walked about 30 km at least - it was definitely a very hard day - and we went through Thoka (4620 m) to Pheriche (4240 m) to Shomare (4010 m) and finally arrived at Pangboche (3930m) where for the first time in 57 days we actually slept in a real bed in a real building. The fact that the porters never arrived with our bags didn't seem to phase anyone as we had slept in the same clothes for 2 months, another night without anything was a minor inconvenience. Leaving Everest Base Camp for the last time from J Rob on Vimeo. The expedition is almost finished - we had a meter of snow for the last 2 days - it is time to go home after a successful summit of Everest. Today we walk nearly 30 km down the Khumbu valley...it is going to be a long hard day and I just took this video 5 minutes before we left base camp. Rest day, and - yes - we had snow all day. About 15-16 inches of snow and it was nasty. By end of day we had over 1 meter of snow. It just caked our tents and a few of the members tents collapsed under 18 inches or more of snow that accumulated on their tents. I woke about 5 am and realized it was way too quiet and got up and cleared my tent. By 6 am myself and one or two other early risers were clearing members tents with shovels. Most of us think we will be here for 3 or four days. 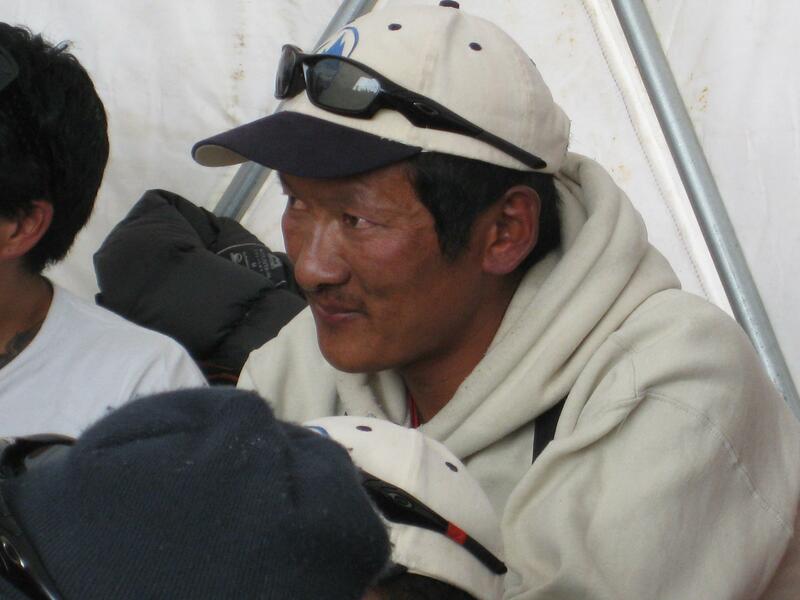 Phurba Tashi - Our chief Sherpa and one of the most competent high altitude Sherpas in Nepal. Today we walked from Camp 2 to Base Camp through the Khumbu Icefall. We woke up at 3:30 am and left at about 4:30 am. I was not feeling well at all, excessively tired, and very weak. We had eaten precious little food for the past few days, typical of being at high altitude where one has no appetite at all. Once I packed my back pack, I really felt that I would not be able to carry it all the way down to base camp. It was really heavy since all the personal gear that we had taken up on two trips to Camp 2, had to be brought back. The trip was not too bad, as it took about 5 hours, but even a few hours in the icefall, is not pleasant. One thing that was really nasty was a new ladder across a crevice that had 5 ladders roped together. It was by far the most rickety ladder we crossed. By the time you were in the middle, it bounced and swayed and was plain nasty. The crevice was about 50 feet or more deep and it really was a difficult ladder. One of our members actually slipped off and ended up crawling over on his stomach. It was not fun to watch as I had just crossed and was leaving when this happened and I had to go back and help steady the ladder for 10 minutes or so that it took this member to get across. Every time he moved his feet, he either caught a crampon on a rung, or his backpack started to slip to one side. Eventually with much advice and support, he got across and recovered. It was not a pleasant event to witness. The rest of the trip through the icefall was uneventful even though it was snowing most of the time. At least with the cold, the icefall is much more stable and we were also completely through it by 9 am which was our team's suggested time for getting through the icefall, and a clearly well thought through deadline. My tent the day after we arrived back at Base Camp from the summit. After I had cleared 18 inches of snow off the top. The rest of the tents are hardly visible. After removing our crampons at crampon point, on the edge of the main Everest Base camp, we walked the 25 minutes or so to our Base Camp and as we entered the camp, there were horns, clashing of tins, and loud noises, a scene repeated for every climber, guide and Sherpa that returned from a successful summit. Even though it was snowing heavily when we arrived, everyone at Base Camp was out in the snow greeting and congratulating us as we returned from our epic adventure. It was a truly remarkable scene and one that I will remember for the rest of my life. 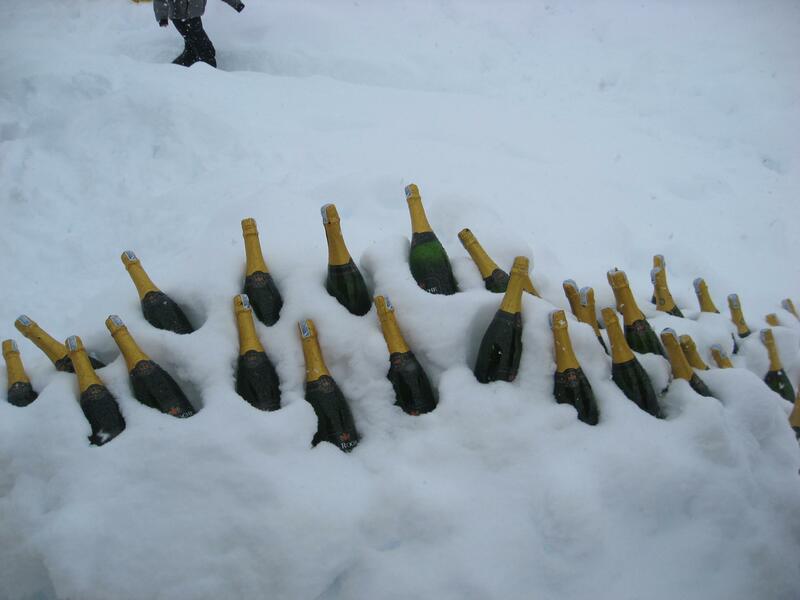 30 Bottles of Champaign awaited us as we returned from the summit to Base Camp. Khumbu Ice Fall - 1 from J Rob on Vimeo. Khumbu Ice Fall - 2 from J Rob on Vimeo. Today we moved from Camp 4 down to Camp 2, leaving at 7 am. Camp 3 was dismantled overnight so we had no choice but to go on to Camp 2. We started at 7 am as the wind was very strong, and it was also very cold. Of course, we were still in our down suits. 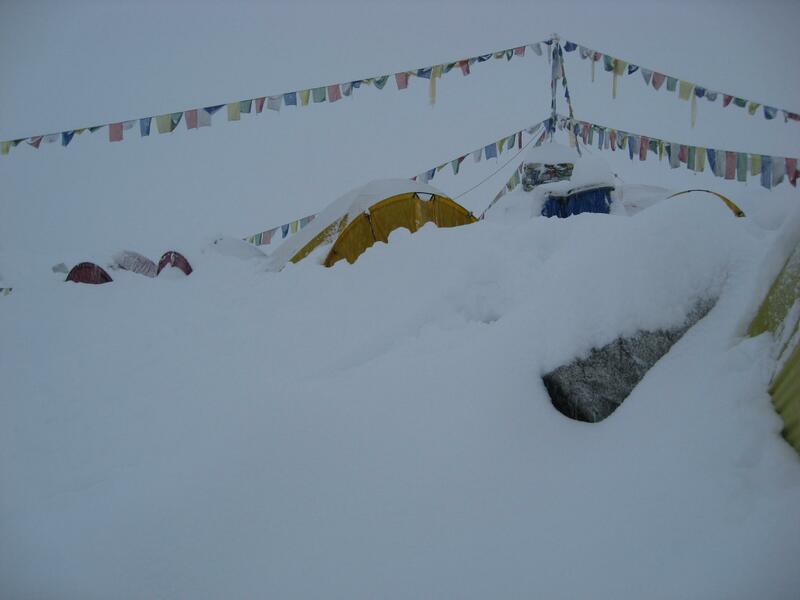 Camp 4 is on the South Col and is subject to continuous high winds. The route is over the Geneva Spur, down over the Yellow Band and then a traverse across to the Lhotse Face and down to the Western Cwm and on to Camp 2. The last distance of about 1-2 hours is a gentle slope down to Camp 2. I was very tired and found this entire day really stressful. It took me around 5 hours to get from Camp 4 to Camp 2 and when I came into Camp 2, I was totally wiped out. Looking down from the traverse (descending from Camp 4) near the Yellow Band. Camp 2 is over 5000 ft below. If you slip here you will not stop till you hit the bottom. I saw a pair of mitts slide down, and some of my colleagues saw an oxygen bottle fly down the entire distance and disappear at the bottom. 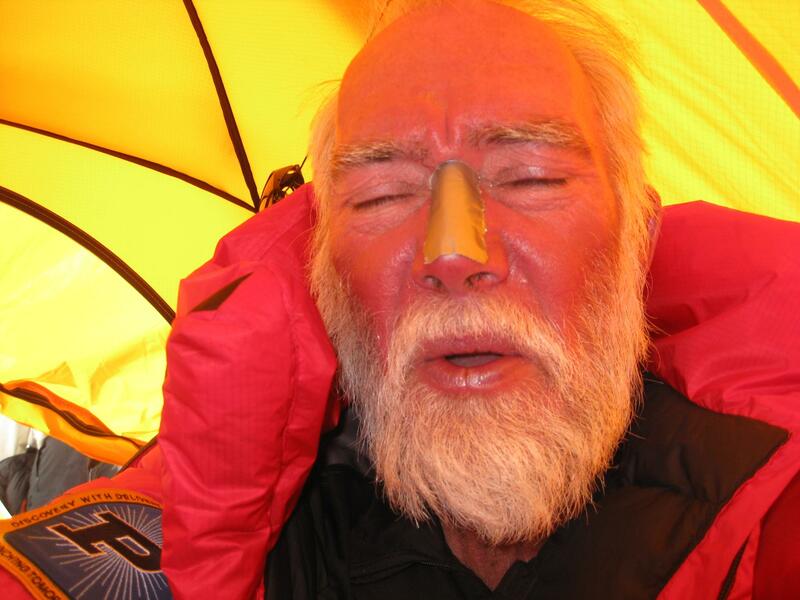 JPR trying to regain some composure after descending from Camp 4 to Camp 2 after the summit. My face is pretty badly burned from having my mask and goggles off too long on the summit (some people never learn). Descending from Camp 4 to Camp 3 - Everest from J Rob on Vimeo. At 1 am our team left Camp 4 for our summit attempt. We left later because of the potential for lower winds later in the morning. Low winds means less chance of losing fingers and toes! The first 4 or 5 hours requires a steep climb to what is called the "Balcony". On the way up we came across a climber by the name of Mike Farris who was having extreme difficulty. Apparently he has left for the summit the day before and had problems. Amazingly he had no radio to communicate with his people! Something that frankly no person who is prepared would do. He asked for our help and members of our team gave him oxygen and radioed down to his team as well as our own people at Camp where he eventually ended up for most of the day till his Sherpas came up to get him. I find it amazing that people claim to be independent climbers and its fine until things go haywire and then they are in total trouble. The mountain is littered with bodies of people who were trapped by difficult circumstances and in many cases without the wherewithal to recover. Farris was in my opinion, one such individual who ended up depending on the goodwill and support of large teams. View of Everest from Camp 4 on the South Col. It took me 9 hours to reach the summit from this point. We left at 1 am and arrived on the summit at 10 am on May 23, 2009. One of our members found his backpack just up from the Balcony, and another apparently picked up his oxygen mask and found it working fine as they tried it out. The tragedy of this story as I was told later was that Farris ended up with most of his fingers and toes and nose badly frostbitten. This story could have had a better ending had this "independent" climber chosen to have a support matrix around him so that when things went wrong, he had help. He didn't even have a radio to call for help on! This I believe is nothing less than stupidity. Every member of the HIMEX team including every Sherpa, guide and member had a radio that was monitored every minute of every climb. Climbing mountains like Everest is not something that you should do unprepared. All you do is put those that are prepared at more risk, when they have to detour from their well laid plans to aid those who are not prepared. I am not saying that we should not assist those who need assistance - of course we should - but their stupidity in the end should not be rewarded with praise. Indeed, they should be chided by the mountaineering community for the idiocy of their ways. There is no glory in putting oneself in danger and others at risk to save them. I have no hesitation in stating my views on this publicly, as I find it amazing that such events occur, and they occur every year. I even heard that Farris had written or was writing a book on surviving Mt. Everest. What a crass notion that would be! The Balcony is a small area that is relatively flat and where about 20 climbers could sit down to rest. Here we dropped off one of the 2 oxygen cylinders we carried up in our back packs. From here we climbed for some hours up pretty steep rock slope. It was pretty slow here as we caught up with a large group of climbers that were painfully slow and there was no way to pass. It is these times that one must make sure that ones hands and feet dont freeze. Eventually we made our way onto the South Summit where we changed oxygen cylinders again from bottles stored there by our Sherpas and moved across to the true summit climbing up Hillary's Step. This is a really difficult area where you have to climb over fairly large rocks to get around to an area that allows you to move up the slope. Its a fairly long time of moderately difficult climbing until we reached the rather small area of the Everest Summit. It was an amazing time being on the summit, even though the weather was not particularly nice with winds, and clouds. I summited at 10 am on May 23, Nepal time. When we arrived at the summit there were already about 15-20 people crowding the summit so we waited just below them till they all left and we were on our own for about 40 minutes on the top of the world. The first thing I did was have Nema, my Sherpa take photos of some mementos that I had carried to the top for a fellow member who was taken with a serious medical condition on his way to Camp 3. I think I mentioned this earlier. I promised him I would take his things to the top and I did, and so we wanted to photograph everything. Then Nema took a stack of photos of me holding up the ISAC flag, and some Purdue flags and then I made a shot video commentary to family, and colleagues. Of course at this point, the camera battery died so that was the end of photos. The only minor irritation was that I put my ice axe down to hold something for a photo and of course it went sliding down the hill Only 10 feet fortunately so we rescued it! After all was done and good, it was time to leave. It's an interesting feeling having spent the best part of a year preparing to do this and 35 hours of climbing to get there and you have to go, knowing you will never again be at this place. It sounds odd, but I sort of enjoyed the time I was there and didn't really want to leave. But of course we did and spent the next few hours winding our way down again being held up numerous times at critical points by climbers who seemed to have no idea how to go down a rope! 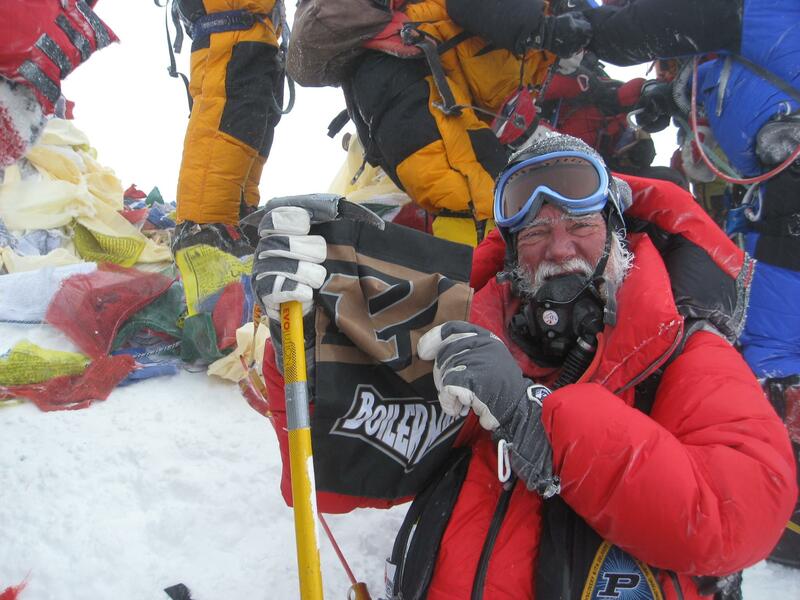 On the summit of Everest showing off the ISAC flag, and the Purdue University flag. We made it back to Camp 4 where Phurba our Sirdar, had hot tea ready for us - and helped us into out tents for a long afternoon and evening of rest sucking in lots of oxygen and listening to the roar of the ceaseless wind literally rock our tent until we left at 7 am to descend to Camp 2 the next morning. Today we moved from Camp 3 to Camp 4 on the South Col. We left at 5 am and immediately started up the face which is rather steep. It was about 3 hours climbing before we crossed the traverse and came to cross over to the famous Yellow Band. This required climbing up the band and then across to the Geneva Spur. Once up the Geneva Spur we had to walk around the Spur to the South Col where our Camp 4 was located. JPR at Camp 3 just about to leave for Camp 4 about 5 am. Camp 4 - some thoughts 12 hours before summiting Everest from J Rob on Vimeo. Today we moved from Camp 2 to Camp 3 on the Lhotse Face and left at 5 am. It was a particularly hard day. One of our team members collapsed and had to have an injection of Dex; and that meant he had to abandon his climb. 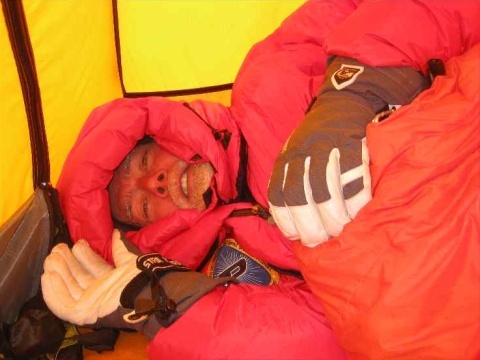 It was rather distressing as we spent about 90 minutes to 2 hours with him before one of our Sherpas arrived with oxygen and took him back too Camp 2. We all continued up the hill to Camp 3, but the sun was pretty hot by the time we arrived at Camp 3 after 9 hours. I suspect that I got badly sunburned and I was definitely very dehydrated by the time we got to camp 3. We slept on oxygen at Camp 3 and stayed on oxygen continuously from there. View from Camp 2 the day before we went up to Camp 3. Note the lines of climbers on the traverse, going up to Camp 3 and the yellow band in the top center. I was looking through one of the Discovery cameras and I counted 92 climbers going across the traverse. You can see a thin line across - these are those climbers. Some of our first ascent team is among them. Camp 3 Everest - some thought on the way to the summit from JPR on Vimeo. We left at 12 midnight from Base Camp to go to Camp 2. We left earlier because the previous team got caught in the heat of the Western Cmb and nearly fried. I went through the Icefall in about 5.5 hours (as opposed to 7.5 hours a few weeks earlier) but then it took me another 5.5 hours to get to Camp 2. Eleven hours, many of them in the heat. It was really stressful and I struggled to get into Camp 2. Fortunately we had a rest day to recover. 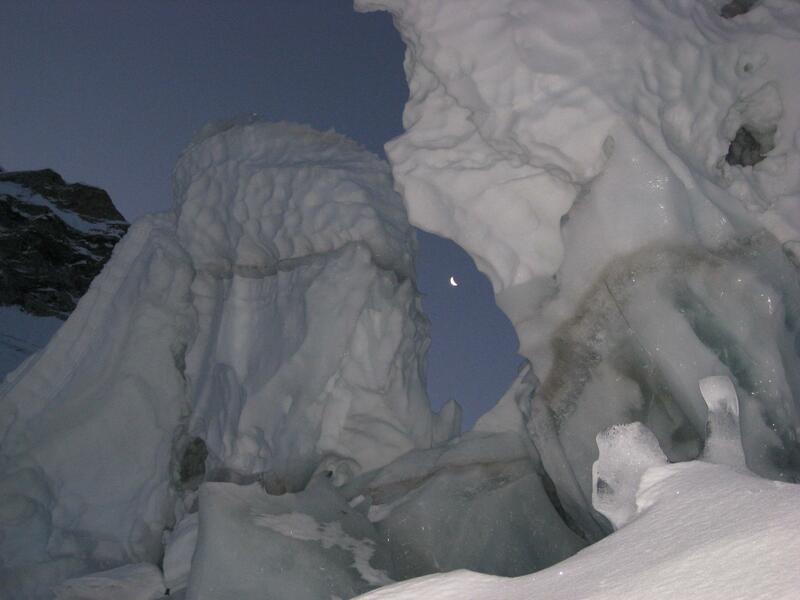 Two huge ice seracs, 40-50 feet high, with the moon just showing. This was taken about 4:30 am as I neared the top of the icefall on our summit push. If you want to know what agony looks like, take a look at this! At Camp 2 with some sunburn on my nose. I had to put some duct tape there to prevent the oxygen mask from chaffing the top of my nose. Some thoughts at Camp 2 Everest before the summit from JPR on Vimeo. Rest day. Sunny, beautiful day! Today there was a long guides meeting after breakfast where the final summit teams were selected and the dates defined. I can't divulge right now what the details are, but we are now all quite relieved as we know exactly when we are going for the summit and who our guides and teams are. There is much conjecture around the entire base camp as to when everyone is going. So we have been told that we cannot at this time divulge our teams plans. 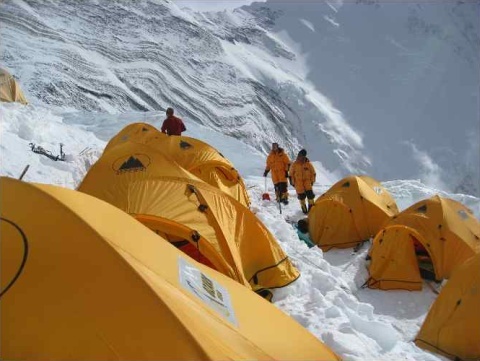 We understand that there are around 300-400 climbers at least maybe 500 at base camp. On top of that an almost equivalent number of Sherpas and guides. So, it's going to be crowded going for the summit. I did see about 30 people going up the icefall at 6 am this morning, so they are either Sherpas taking loads, or climbers going for the summit now. Since we have 22 climbers left (5 dropped out, 1 already summited) we have 6 less to fit onto the teams. So that makes it moderately better in terms of Sherpas-to-member ratio since we have, I think, 29 Sherpas on our team. One thing is for sure, we now have all firmly set our eyes on one task, and one task only - our summit attempt. For the last 44 days since we left Kathmandu, the only task we have been set was to become acclimatized to the high altitude. Several (5 actually) for one reason or another were unable to acclimatize or decided not to continue this venture. It is psychologically very hard indeed to spend so long in preparation and much of the time just waiting around doing nothing. The trick is to acclimatize but not lose so much weight and muscle that you get weaker and weaker. So, that is why we went up to Camp 3 but did not stay there. Even at Camp 2, it is thought that you move over the balance where you lose body mass at a faster rate than you can gain it. So, Base Camp is apparently neutral, although I figure I have lost about 15 lbs so far. The way I look at it, it makes my backpack 15 lbs lighter! We have been resting, literally using as few calories as possible, and eating as much as possible every day. Most days, I have no problem eating 3 meals a day. Its always eggs and toast, often with bacon and beans for breakfast, and lunch is usually a salad, potatoes, veggies, and a variety of additional things such as canned fish. Dinner is always hot soup which is always excellent, followed by pasta, potatoes, meat of some sort, veggies and baked bread followed by desert of fruit or some other nice desert. The food at HIMEX is really excellent and frankly, we have yet to have a bad meal. I think it fair to say, that everyone is sleeping well at this altitude (5250 m - 17,500 ft) without any problems. In fact, I think we have acclimatized so well, this altitude almost seems normal, until you bend down to pick up a moderate size rock to support your tent, and you realize its not really normal at all. Mt Everest glistening in the sunshine as the sun sets. Picture taken from the top of Lobuche East (6119 m) about 6 pm. So, without divulging the dates we will leave, here is the summit plan. On day 1 we will leave at 2:20 am from our camp, walk to crampon point on the icefall edge of EBC - about 30 minutes walk. We will put on our crampons here and start moving up the Khumbu Icefall. Hopefully it will not take me the 7 1/2 hours it took last time. I am aiming at about 6 hours or less to what was Camp 1, but we will not be permitted to stop at Camp 1 this time, we will continue another 3-4 hours to Camp 2 where we will stay for about 36 hours. We will leave around 5 am from Camp 2 to climb to Camp 3 (6300 m) where will stay overnight sleeping on oxygen. About 5 am the next morning we will leave Camp 3 on the Lhotse Face to climb to the South Col at 7,900 m. We will stay overnight again sleeping on oxygen. At some ridiculously early time to be revealed to us, we will leave from the South Col on our summit bid. It is a long way - around 900 m in height - almost a kilometer in vertical climbing! 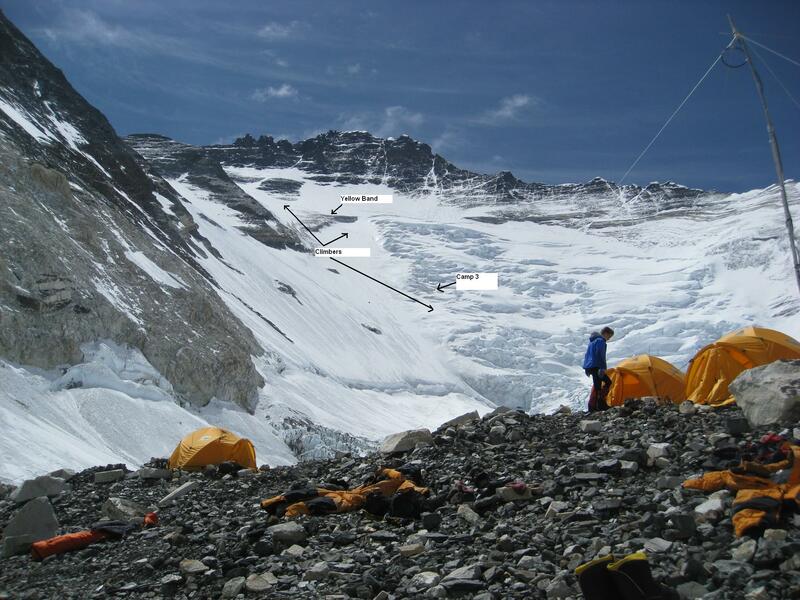 This will probably take 9-10 hours and then return to Camp 4 at the South Col to sleep again on oxygen. Next day, we will move from Camp 4 to Camp 2 where we will stay overnight and next day return through the Icefall as early as possible to Base Camp! I have to say that after all this time preparing for this its nice to have a firm date to leave. I have not yet resolved in my mind how to cope with the stress and extreme exhaustion that we will face for basically 6 days straight. But, one hopes that we have reached a point where we can play the mind over matter game to get through this next part. Having already been through the Icefall and up to Camp 3, certainly gives once confidence that we can do that again. From Camp 3 thought, its two very difficult sections and on summit day, you have to go up and back. Since we are now very close to the end of this expedition, I can' but help to remember what the driving force has been. My goal, as I have said many times, is to raise awareness of the issues of AIDS and the lack of diagnostic tools for a great number of people in resource-limited nations. If you have not already done so, I exhort you to go to www.cytometryforlife.org and make a donation to the cause we are working toward. Across the cytometry world, there have been many individuals who have worked toward a solution to low cost diagnostics. However, the problem is far greater than any one group can solve. So this is the time for you to go to the above site and find the donation page and make a statement for the field of cytometry. When I return, I will be spending a great deal of time promoting some specific solutions to the cytometry issues that face those trying to bring very low cost, affordable CD4 diagnostic to those in rural environments. I am surprised that some of the proposed solutions that were heavily promoted at the 2006 AIDS Congress in Sydney seem to me to have been dreams! Frankly, in the last couple of years, I have been told of so many incredible solutions to low cost CD4, I might be excused for thinking that some of them might actually work. Frankly though, it might be the lack of oxygen up here on Everest, but my gut feeling is that most of the proposed solutions are pretty much hot air. For some reason, CD4 seems to be an easy term to use to raise the term sheets of start ups but not much more. I have written a more detailed e-mail that will be sent to the cytometry discussion list in a day or two, so I will leave it to that email to challenge some of you on this issue. In the mean time, I will start to get ready to move up the mountain. Its around 14 in the match and it's about time. I am looking forward to a real bathroom, a real shower, changing clothes less than every 8-9 days, not sleeping in a sleeping bag, not wearing a backpack for a long time, being able to talk to someone in my own field, not having eggs for breakfast every day, drinking real coffee, not drinking Sherpas tea (which is great on the mountain), not sleeping in a tent, and finally, being able to breath real air! Rest Day - Snowed - relatively miserable day. Some sun. Rest Day - Snowed - relatively miserable day. Little sun. Rest day - Snowed - relatively miserable day. No sun. Our camp on the summit of Lobuche East - note the red tent is only a few feet from a drop of thousands of feet. The sleeping bags are drying out from one of our previous teams that camped their the night before. Of course they are clipped on to the tent so they don't blow away. Rest Day. It's snowing today - several groups tried to go for the summit in a 5 day run, but they had to turn around because of high winds. Tomorrow winds of 90 km/h are predicted - our maximum safe wind speed is around 20 km/h which means a minimum temp of around minus 30 C - that is not predicted for 10 days or so. So, this morning my primary activity was re-leveling my tent - since we are on a glacier - the tent sinks over several days and we have to keep building up and leveling the base. It's a lot of work at this altitude. Rest day. What a food day! Since one of our members left a day or so ago by a heli, Russel Brice organized an incoming food drop on the heli - we had the most magnificent Norwegian Salmon - huge Salmon and so lunch was just extraordinary. In fact, breakfast, lunch and dinner were the very best we have had since we arrived. On long rest days, it seems the food is really worth while. Of course, I have lost a lot of weight - not sure how much, but I suspect about 15 pounds (7 kg). It's not that the food is not great, it is the various times you go off on acclimatization expeditions - if you go high, you just lose weight. 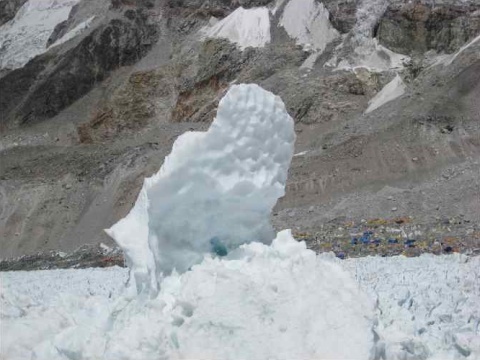 I have not commented so far on the big avalanche that hit the Khumbu Icefall a few days ago. It was very big and I am sure all the blogs have discussed it in detail. We saw it happen at 10:30 am from our Base Camp - and unlike most avalanches that happen around the camp, we did race outside and watch this one more than dust the entire Everest Base Camp (but not ours as we are 20 minutes lower than the traditional EBC). The sad thing is that a Sherpa was killed and two climbers injured - but apparently ended up walking away. 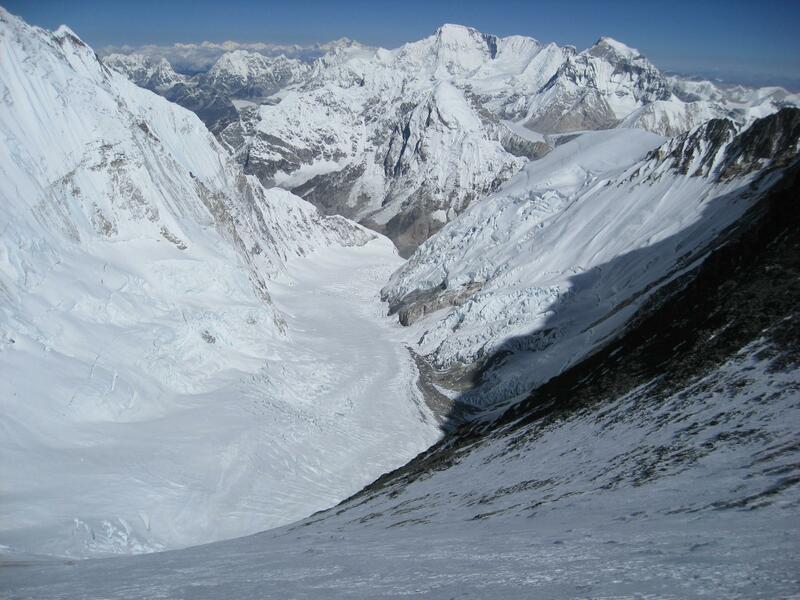 For the past 3 days, we have observed teams of people on the Icefall looking for the body of the Sherpa. My understanding is they have not found it. The team caught in the avalanche was apparently "Asian Trekking" from Khatmandu. I really don't know any more details and chances are, most details you read on the web will be 3-rd or 4-th hand reports (typical of Everest Web information), so they may not be particularly accurate. We are all very glad that all of our HIMEX team was down the Icefall before this big avalanche happened. 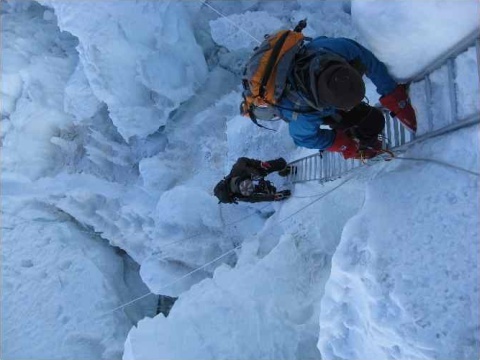 It has been drilled into us that the Icefall represents danger, and we try our hardest to be in the Icefall only at night or early morning when it is most stable. 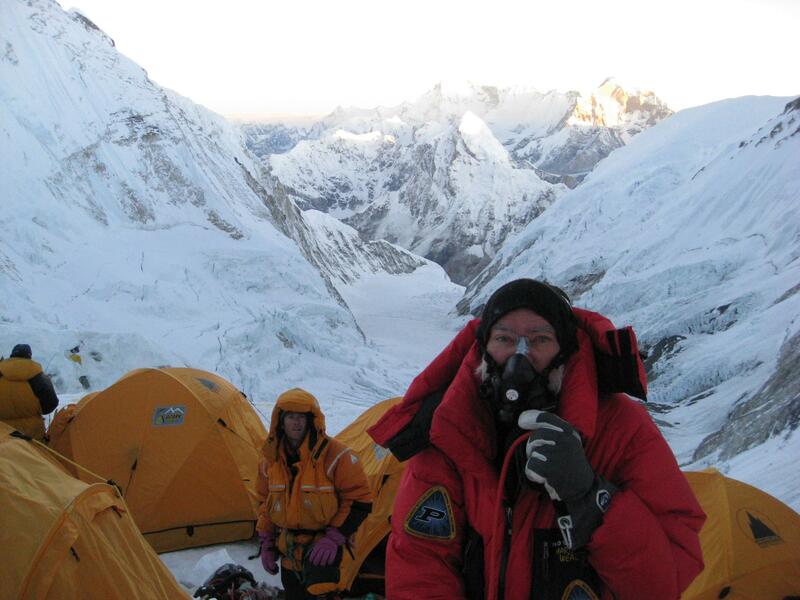 This is probably a good time to remind those of you following my Everest Expedition, why I am here! Remember, my goal is to raise both funds and awareness of the difficulties in dealing with AIDS in resource limited countries and that I believe we can make a major impact if we in the cytometry world, focus a lot more in producing low-cost, easy to use, lightweight diagnostic instruments for CD4. Surely this is just one aspect of management of AIDS, but one that needs a lot more effort than presently being made. Our program at Purdue is just one for sure, but my goal is to encourage all of you to make a contribution - please go to www.cytometryforlife.org and go to the donation page and make a contribution. Thank you for doing this. The best time is now. Of course I will remind you again before I finish this expedition. Rest day at Base Camp. Absolutely nothing to do - just rest. I am reading lots of books... We can go for long hikes, but frankly, the rest is worth more than the exercise. We may go down the road an hour or so tomorrow just to keep the legs going. Today we went from Camp 2 to the Base Camp. My tent mate Bruce was not feeling well so we went very slowly. 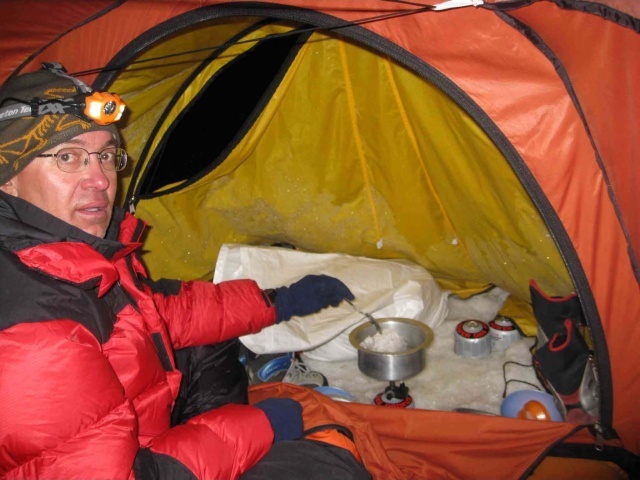 We made Camp 1 within 75 minutes and then started through the Khumbu Icefall. It was the first time that I got a chance to see it in the daylight. It is pretty scary actually and goes on forever. There are over 30 ladders on the ice fall. Some go up, some down, and most are flat over crevices. Clipping onto ropes on either side, one navigates the rungs trying to get the front claws of the crampons over the rung, and then the next foot, etc. Most are about 10 feet long, but some are 2 or 3 ladders roped together making a somewhat shaky track. We had to wait for about 15 minutes at one ladder as the Icefall Doctors (a group of Sherpas paid to maintain the route across the Ice Fall) were repairing a ladder that had dropped into a crevice after a huge block of ice cracked apart and wrecked the route. I managed to take some video as I descended but dont know how it tuned out as I was clipping in, holding the camera and the ropes at the same time! We finally reached crampon point 5 hours after leaving Camp 2 and another 30 minutes to Base Camp. The first thing I did was have a shower and change of clothes after 5 days! I am certain to sleep well tonight. Its not clear how long we will now wait at Base Camp. The long term weather reports indicate strong winds on the mountain for the next 10-12 days, so it looks like a very long rest. 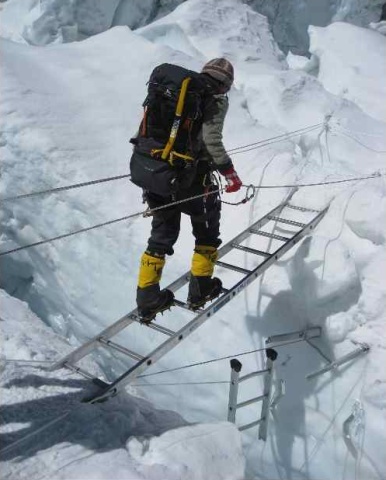 Tentmate Bruce Parker descending a long ladder in the Khumbu Icefall. 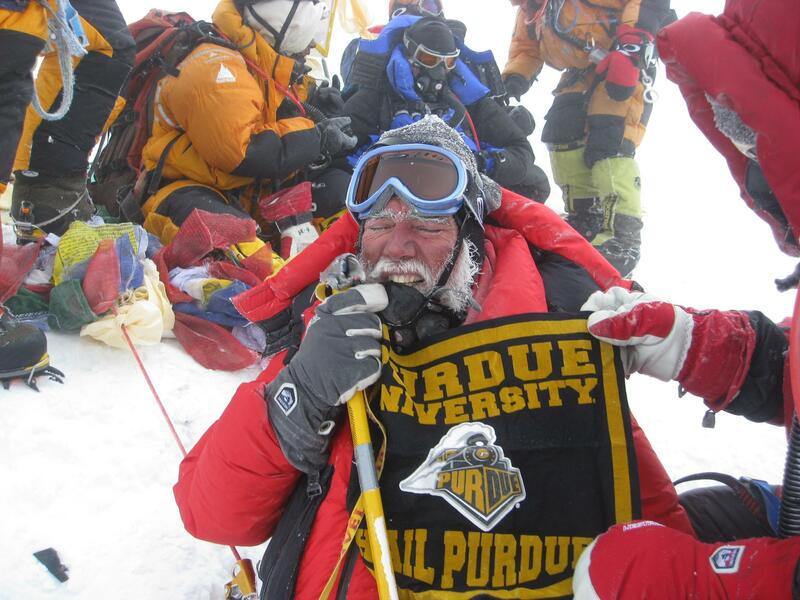 One thing that was very exciting was that one of our team members, David Tait, was able to summit Everest yesterday. The fist summit of the season! David was going to go without oxygen, but because of time constraints he decided to go for the summit with oxygen immediately after the rope fixing team fixed to the summit. Today we descended from Camp 3 to Camp 2. We left at 8:30 am because of the extreme cold. We followed a long team of other climbers. Descending very steep ice is hard and takes a great deal of concentration. While it would have been preferable to abseil down, with so many climbers its just not possible, so most of the descent was using a half Austrian arm hold meaning its faster, but requires much more energy. What took nearly 6 hours to climb, took out 2 to descend, even with the traffic jam. I had to stop for about 20 minutes at once stage after a climber about 5 ahead of me, slipped and fell about 20 feet. It took him a long time to recover and I was grateful for the chance to rest. Once I got to the bottom of the Lhotse face, I literally dawdled down to camp 2 where I enjoyed a few hours of sleep in a boiling hot tent and a fairly decent nights sleep which at 6400 m tells me I have really acclimatized pretty well. Camp 3 taken from my tent. Camp 3 is on the Lhotse Face about 7300 m and is pretty cold and windy. Today we left at 5 am to climb to Camp 3. I have to say, this was the hardest day I can remember. For 8 and half hours we climbed up ice. I estimate that the lowest angle of ascent was 45 degrees going up to 75 degrees. It's entirely on ice so at times its extremely slippery and very difficult indeed. For 8 and half hours we crawled up the Lhotse face where our camp was located at 7300 m on the side of the mountain. Helmets were mandatory since chunks of ice were constantly falling from the many climbers above. It was also very cold and we climbed in our down suits. There are two levels of camps at Camp 3 with the lowest camps about 7200 m. We reached this level and rested for 30 minutes, and then it took over 90 minutes to reach our HIMEX camp just 100 m above. An advance rate of just about 1 minute per meter. Once we reached camp, I had to go get snow for melting and it took the next 5 hours to melt enough snow for two of us for drinks and a dinner of chicken soup. It probably need not be said, but there is absolutely no sleep to be had at 7300 m - and not much appetite - but a guaranteed headache. Guide Shinji crossing a crevice. Note that the previous ladder hangs crushed as the ice fall changes daily. We left Camp 1 at 5 am to walk up to Camp 2. It took about 3 hours 15 minutes arriving just after 8 am. The sun hit the camp at about 8:20 am so we were spared the deadly heat of the Western Cwm. We rested all day at Camp 2. Camp 2 was quite amazing - a large dining tent that could seat about 16 at a time, a large cook tent, and about 10 tents for clients. It's sort of 3 star in the hotel on the mountain standards. The "Hand of God" - a magnificent ice "hand" on the Khumbu Icefall - with Everest Base Camp in the background. Camp 2 at Everest from JPR on Vimeo. Well Hello again after 5 days! I have to say that this last 5 days were most definitely the hardest 5 days I have ever experienced. It was physically exhausting. We left for Camp 1 at 2 am, May 2. We walked about 30 minutes to crampon point where we put on our crampons and started up the icefall. Frankly, I found it incredibly hard work. Fortunately it was dark so we did not see much of the icefall itself. Twice I had to stop to retape my feet. My boots were definitely hurting with the constant up and down and without retaping I would have ended up with trip-ending blisters. However, the icefield never stops. It is really hard work and I took over 7 hours to get through to Camp 1. Fortunately, Sherpa Cassan never left my side until I reached Camp 1 at about 10:30 am, by this time the sun was beating down mercilessly. I literally dropped into my tent and spent the next 6 hours trying to recover. My tentmate Bruce cooked dinner and I managed to get some good sleep. 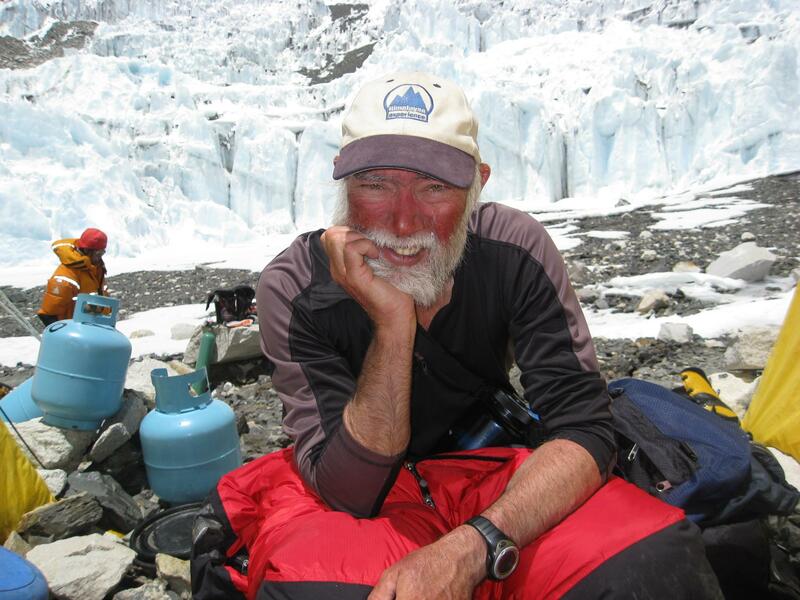 JPR at Camp 3. Its quite cold so full down suit, gloves and the sleeping bag Still no sleep. Two days ago, I watched our first group make their way up the icefall at 4 am. Fortunately I can see the path from the back of my tent. It was an amazing sight as about 15 climbers and about 25 Sherpas crawled up the icefall with their lamps clearly showing the pathway. They looked like small ants with lamps as they advanced up the tortuous route through the icefall. There are over 30 ladders on the icefall - most are flat across crevices that are rather deep. Some are vertical. So it takes a long time to clip in (double ropes on the ladders) before and after every ladder. The entire icefall has fixed ropes of course. The reason we are travelling through the icefall at night is the increased stability of the icefall at lower temperatures. So it is far safer to travel in the dark, and an added bonus is that you can't see how deep the crevices are! So, if all goes well, we will return to base camp about May 6-8 so we can do it all over again! It is a really long time, isnt it? Today at about 3 pm, I just got back from our second trip to Lobuche East summit. Yesterday we went from Lobuche Base Camp all the way to the summit and camped on a ledge at the top no wider than 20 feet - two rows of tents!!! Over the edge - 3 to 4000 ft. Naturally even to take a leak we had to clip into the lines. No sleepwalking at this camp. Unfortunately I had a headache all night and even with an Ambien only got 3 hours sleep, so the descent at 7 am this morning was tough. Down about 4000 ft and then the 12 km walk to Everest Base Camp. Frankly I am wiped out now. It took me 4 hours to walk back to camp and I literally crawled into camp - the highlight though was that I got to take a shower (my third in about 24 days!!) and so I feel better for that, but my back is aching and I am worn out. Hopefully the next 3-4 days will be rest days before we head across the Khumbu Icefall to stay at Camp 2 for several days of acclimatization. Once we leave for Camp 2, I suspect we will be gone for about 6 days and no communication at all. Then we will be back waiting for the weather and the winds to comply for our summit bid. Lobuche - camping on the summit - Nepal from J Rob on Vimeo. This 6,119m peak was one of our acclimatizing peaks - we climbed it twice and the second time, we camped on the false summit). Last night we had a team meeting to discuss future climbing plans. It was decided after discussion with the leadership and guides that we would make another trip to Lobuche East. So the group I am on, will set out after lunch tomorrow and walk the 12 km to Lobuche Base Camp (4800 m), stay overnight, then the following morning we will move up to just below the summit of Lobuche where a new camp has been established at 6100 m. Last time we made our way up to what was Camp 1, but this time we will go all the way from Base Camp to Camp 2. This will be on the false summit of Lobuche East (just below the real summit) where there is a small ledge similar to camps that will be higher up on Everest such as camp 3. JPR sitting on a minor peak (5600m) near EBC. We sat up there for a couple of hours for acclimatization. We will stay overnight up on Lobuche East and then return to Lobuche base camp next morning quite early, and then back to EBC. I think it will be quite a hard day work on both days, as we are doing the same thing we did last week but a day less and sleeping at 6100 m as well. The goal of course is to get us acclimatized. I believe the decision was taken to go back to climb Lobuche again was based on the instability of the Khumbu Icefall which has experience three significant collapses on the trail in the last 4 days. Staying away from the Khumbu is not a difficult decision, but eventually we will have to cross it. As far as we understand, no one was injured on any of the collapses so far. So, day 25 will be walking to Lobuche Base Camp (12 km); day 26 will be climbing to the summit to sleep at 6100m; day 27 will be descending to Lobuche Base Camp, then walking the 12 km back to EBC. My next communication will probably not be until Day 28 (April 26, I think). Basically then the goal will be to rest a couple of days, then make an attempt to get up to Camp 2 on the Western Cwm of Everest and stay there for several days and during that time, get up to Camp 3 and stay overnight, then descend to EBC to rest until the weather is right for an assault on the summit. Ranulph Fiennes: "Mad, Bad and Dangerous"
George Soros "The Crash of 2008"
Today the cricket match is taking place. I was going to try to sneak away and walk the 4 or 5 km uphill and down to watch it - it was going to be a rest day - but Russel decided that the two groups that have not taken the test course on the ladders over the crevices will do that in a few hours with our big boots and crampons, ice axes etc. We have had a fairly tiring last few days. I need to recover - have developed a bit of a cough - nothing serious though, so rest will get rid of it hopefully. The icefall is a little unstable and several sections have collapsed over the past few days. The other big event today was I was able to take my second shower in 20 days and washed clothes as well. It was a great way to finish the day. I decided that everyone else smells! The supply tent for materials going to Camp 2 - note the many bottles of oxygen and tents that have to go up the mountain. Our base camp is really superb. It is clean and well organized. It is far nicer than the higher Everest Base Camp which all of us found rather smelly, crowded and unhygienic really. People are literally on top of one another, toilets next to water sources, and yaks everywhere. It really was not very nice. I am very glad that the HIMEX people decided to build their own base camp about 15 minutes lower down. Also today, one of the climbers brought a Scalectrix car set - so we set it up in the pod and we have been racing cars! Have not done that for over 45 years! Forgot what it was like to play with toys! But then there is not a lot to do on many days here - just hurry up and wait. The cricket match played on April 21st. Today was a tough day. We left from Camp 1 just above Lobuche Base Camp. Out goal today was to acclimatize on a moderate climb of Lobuche East (6119 m). We camped overnight at Camp 1 (about 5200 m) and left at 5:30 am to reach the summit. It took me 4 hours and I found it tough going indeed. Very steep climbing and some very large steps that are energy consuming. Finally some very narrow ridges, wide enough to plant one foot at a time from the false summit to the real summit and to cap it off a 4 foot wide crevice that we literally had to jump over, and then to the summit - a hanging crest of about 30 feet of ice. We sat on this for 30-45 minutes before descending all the way to Lobuche Base Camp - a drop of 1300 m. It was definitely one of the most tiring days so far. I had a birthday today and climbed Lobuche (6119 m) - a hard day! Definitely too hard for a 56-th birthday- It took me 4 hours to get to the summit. Oddly it is the same distance from the Lobuche Base Camp to the summit as it is fromCamp 4 at South Col to Everest summit, but that is 3 km higher! So I figure it will be just a bit harder! Everest Base Camp and the HIMEX Base Camp (right bottom), with the Khumbu Icefall in the center right going up to Camp 1. I walked from Lobuche Base Camp to Camp 1 about 400-500 m above on the ridge. It took a couple of hours up a fairly steep hill. We arrived about 12 noon, rested all afternoon and cooked our own dinner of some mush with soup and some hot chocolate. And that was itNot exactly the most exciting birthday I suppose, but we did what had to be done. I dont know why, but I didnt sleep a wink this evening. Probably I am a bit anxious about the climb. Turns out, no one on our team of 9 climbers slept well that night either. Well, I am now 56! Today we walked from EBC to Lobuche Base camp - a distance of 12 km. It was an up and down walk. Its not the funniest walk. People talk about paths... well don't believe it - basically there are rocks and you walk from one to the other. Occasionally there are some small areas where you might call it a path, but its rare. It was a long day and we ended up resting all afternoon for our walk up to Camp 1 tomorrow. The Lobuche Base Camp is one place we go to train and acclimatize. Our team of Sherpas and guides. Approaching Everest Base Camp from JPR on Vimeo. The HIMEX whitepod at Everest Base Camp from JPR on Vimeo. Another rest day - I have no idea what I did today - probably just hang around the Pod and read a book. Actually I am up to my 4th book as far as I can remember. The list is below. As one finished a book, it gets added to the library in the Pod! Lots of Sherpas are going up the icefall. Today 26 went up with big loads to Camp 1 and Camp 2. They are established our camps now and equipping them with tents, sleeping bags, food, cooking gear and ropes. They will run the ropes up the mountain for us. It is now 18 days since I left for the Himalayas. We have approximately 53 days of the expedition to go if we leave on schedule. So far the weather has been perfect. We have walked the 60-plus km from Lukla to Everest Base Camp over ten days. We have spent several days acclimatizing and will continue to follow this pattern for the next month to prepare ourselves for our assault on the mountain. We are a large team of 29 climbers and 30 Sherpas, 7 guides and a large kitchen staff. Several of our team are from South Africa and we have had some interesting conversations on the problems of HIV/AIDS in Africa. Frankly, they pointed out to me that things are never as good as we hear - particularly outside the cities. My goal in climbing Everest as you all know is to raise awareness of the problem if HIV/AIDS in resource limited regions. Rural regions are simply not serviced with the basic diagnostic needs on the most part. True there are some that are trying to address the problems, but the efforts need much greater resources. I strongly urge you all to make a contribution to our small cytometry effort "cytometry for life" by making a small financial contribution (www.cytometryforlife.org). We are grateful to those companies and individuals who are supporting this effort. I can assure you that when I return from Everest, my efforts in this area will significantly increase. I am convinced that the cytometry community can do much much more. Thank you for your continued support and your contributions to the C4L program. Kind regards and best wishes from the shadow of Mt. Everest! Today many of the team took a walk to Kala Pattar which was about a 4 hour there and back. I did not go, as I discovered a small infected blister on my small toe. I had noticed it hurting a few days ago, and taped it up, but then forgot it as we did not wear climbing boots around BC. This morning, when putting on my socks, I was surprised to see how nasty my little toe looked, so went to the BC doctor and she lanced and dressed it. It will probably take 2-3 days to heal and it will be fine, but I decided discretion was the better part of valor today and stayed in camp. About 7 or 8 others did the same. I also spent some time working with the kitchen staff trying to establish a water line from a mostly frozen lagoon above our camp, but it was fruitless effort and we gave up. I read and typed up some materials for the rest of the day. We now have places to charge our computers and ipods in the communication tent - and tomorrow I will actually send an email which includes the last 10-12 days. Sorry about that, but it has taken a long time to get BC running smoothly. Today was also a very important day for climbing - Six Sherpas went across the Khumbu Icefall today and established a tent at Camp 1. They left at 4 am this morning. Three of them went on to Camp 2 and also established a small position. This means that the route to Camp 2 at least has been roped. 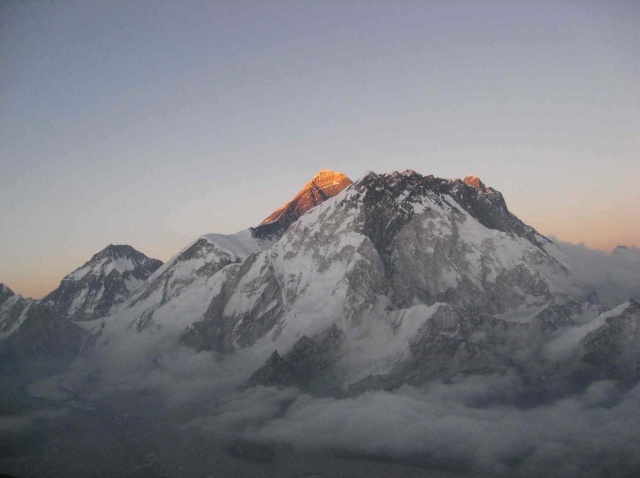 Although I believe our team is going to return to Lobuche base camp and climb a 6000 m hill close to that camp. This will significantly reduce our need to cross the ice fall. Books read so far: Ranulph Fiennes: "Mad, Bad and Dangerous", John Grisham "The Appeal". Today was the Puja that is a traditional event never missed by a climbing team in the Himalayas. The Sherpas have strong religious beliefs and the role of the Puja is to pray for safety and success on the mountain. Today was a beautiful day - no clouds or wind. On this last evening, I had just a very small headache, having suffered headaches on most previous nights. Perhaps my acclimatization is proceeding better after several days rest at EBC. Our base camp is on a large ice flow, but it is not moving much at all - perhaps only a few meters per year where we are. It is about 15 minutes below the regular EBC that all the other teams are located at. Today two members retreated to Lobuche base camp a few hundred meters lower as they were having trouble acclimatizing and had to go to a lower altitude. The team doctor today did my routine medical to check out my condition. My blood oxygen was 85 - an improvement from the 79 I had a few days ago. Hopefully I will get up to 90 maybe if I am lucky. My pulse was only 69 which is pretty good at this altitude. While my blood pressure was definitely up, that too is normal at high altitude. By now my bone marrow is madly making and delivering tons or red blood cells into circulation. These will be necessary to deliver the oxygen we need as we keep going higher. So far, I have been very fortunate - no health problems at all. A number of team members have had stomach or respiratory viruses so I hope to be fortunate enough to miss out on these! A rest day today - that means doing absolutely nothing at all. Even so, the altitude (5200 m - 17,300 ft) is a little hard to take even after taking 10 days to get here. I felt fine during the day, but headaches all night - most nights. It's an unfortunate but routine impact of altitude. At least I am sleeping on and off most of the nights despite having constant headaches. I decided long ago that headaches would be routine and just ignore them - or take a few pills at 3 am to try to run them off - but you really can't. Bedtime is routinely 8 pm and rise about 6 or 6:30 am. In that time, I will wake at least 6-10 times - sleeping at altitude is not easy and one of the hard things to get used to. Hopefully the length of time we spend at base camp will improve our ability to sleep here. Of course, as we go up, it gets worse - but when you know what to expect, its easier to handle. Frankly, I am feeling far better than my last trip to the Himalayas in September 2008, when we climbed Manaslu - there I really had a hard time sleeping at all. Some of the climbers will be returning to Lobuche today or tomorrow - they are not handling the altitude well at all and unfortunately they may not recover at this altitude. 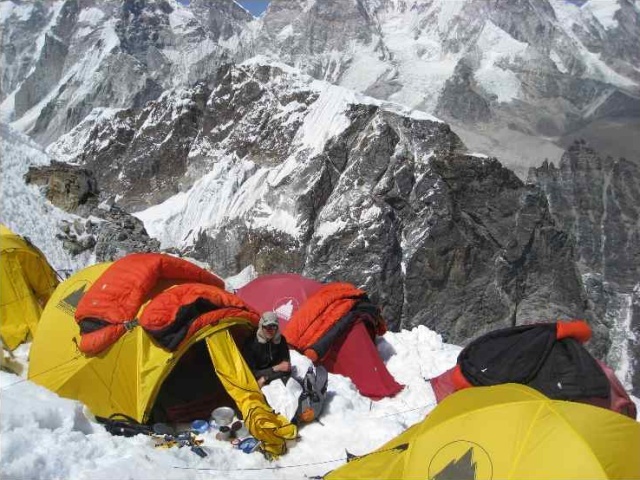 By going down a few hundred meters, they can recover at the lower base camp, spend a few days there and return to EBC. This is nice to know that there is a good opportunity for recovery at our lower base camp. We may need that in the future I suspect. 1st day in the Everest Base Camp from JPR on Vimeo. Today we left the Lobche base camp (50 tents) to walk to our Everest Base Camp (EBC). It was a rise of about 350m or so. It took us about 3 and a half hour of nonstop walking and was a moderately pleasant walk. With only a small rise in altitude it was not particularly stressful and the walk was amazingly beautiful - we were literally walking around the mountains surrounding Everest and occasionally saw Everest in front of us. We also saw our first view of the Khumbu Ice Field which looked terrifying and one of the nasty parts of climbing Everest from the South side as we will be doing. 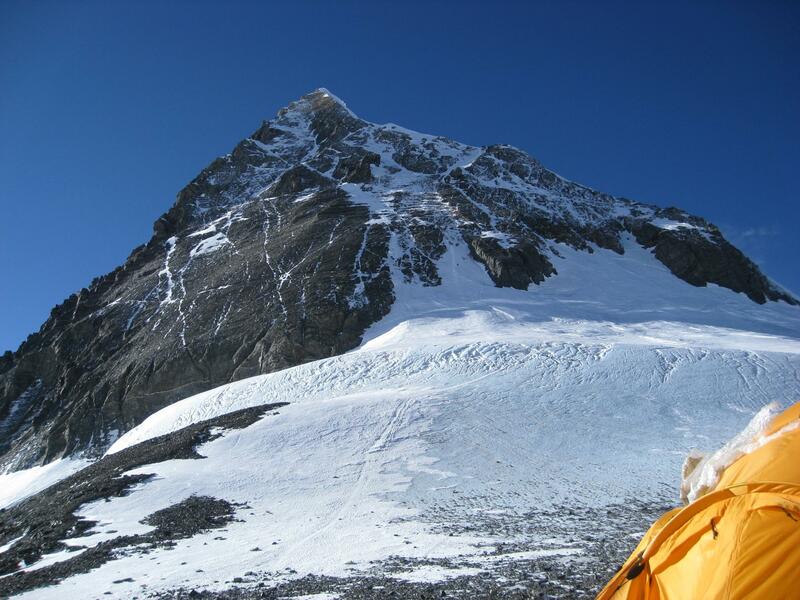 The HIMEX base camp is 15 minutes below the regular Everest BC. The idea was to take a larger spot that is on ground less susceptible to movement as on the regular BC - another benefit is it's likely that we have a healthier environment as I heard that there are 15-20 camps up the hill. Our camp has approximately 60 tents in a sort of horse-shoe design. We have 3 large dining tents and several cook tents and the coup-de-gras - a white pod tent that would be 30-40 foot across and 20 feet high containing a large screen TV, stereo, bar and a really nice environment to relax in. It is placed so that on one side, there are clear plastic windows with a fantastic view of Mt. Everest. We will be at this camp for 60 days so its important to be able to have some of the comforts of life I suppose. Behind the white pod is the electrical and communication tent that has about 50 large solar panels and two whopping big Honda generators. What amazed me was the fact that a Nepalese porter carried each generator from where the helicopter landed about 42 km from here and up probably 2000 m or more in altitude. That would be OK - except the generators weighs 120 kg each!!! I could not believe that one person could carry that weight that far! Actually, we are 60 km from Lukla at EBC - and 42 KM from Namche Bazar - interestingly the Everest marathon runs that 42 KM from EBC to Namche Bazar! So we walked 60 km at least from Lukla and totally up hill-down dale, zigzagging across the mountains. When we leave base camp to go home, we will walk the same distance in about 3 days that took us 10 days to get here. That will be interesting. My tent is in the back row of member tents - and when I open the back flap, I have a perfect view of the back of Everest. It would be quite idyllic, except for the fact that my tent is on a rocky base, it's rather cold at night, and we still have 3.3 km in height to climb and 55 days to get to the top of Everest and back! Today was another rest day - I walked back about 1 km or less to the memorial to many of those who died on Everest. It is very moving site indeed. One of the largest memorials is that to Scott Fischer who died in 2006. I walked around the 50-75 monuments that populate a small ridge. It's not a prominent place - it's really a very peaceful ridge that all trekkers and climbers have to pass to get to Everest Base camp. There were many monuments to Sherpas - and they were all well maintained. Some had nicely made brass plaques, others were chipped into stone. A lot of effort had been put into these monuments and it was well worth the time taken to see them. Everest has a long history of taking human life and it gives one a sense of caution and contemplation as you walk through this sacred memorial. It snowed last night and the temperature was -15 C, so it was quite cold in the tent. In the morning the roof of the tent was covered in crystals. If you move too quickly and brush the ceiling, you get showered with ice crystals. The only way to avoid this is not to breath at night. This is not considered a reliable solution, though. You apparently release at least 1 liter of water just breathing during an average night. 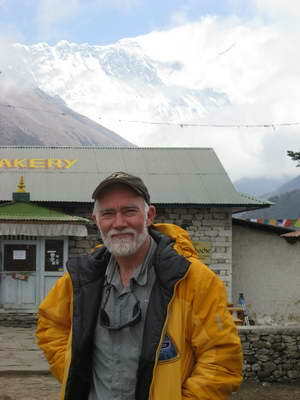 Today, the HIMEX team leader Russell Brice arrived as he had been delayed in Kathmandu arranging for equipment to be shipped to BC. Today a rest day - we did nothing and were still tired! Today we are at about 4800 m, just short of Lobuche. A low base-camp has been established and it is quite an impressive sight. It consists of 43 two-man tents and 8 large 24 by 12 ft tents. It looks like a small village. It's interesting that some trekkers are stopping in as they think it is Everest Base camp. I am not surprised as its a very large camp. The real EBC however is 3 hours or more higher up the hill at 5200 m. Tomorrow we will probably leave for BC. 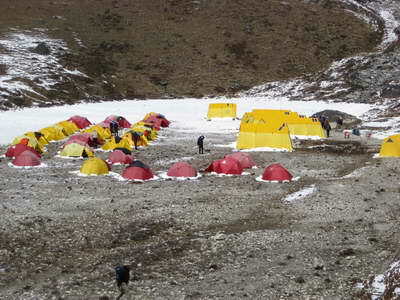 The picture shows the Lobuche base camp - our lower base camp. Today was a reasonably long day - we stopped after a couple of hours for lunch, then a couple more hours to Dingboche - and a rise of around 600 m. It was not particularly strenuous but quite a long way in distance. We walled around the edge of the mountainside and only once went close to the river. Dingboche is not exactly the most exciting town in Nepal. It is quite desolate actually - very dusty- in fact walking here was difficult because the yaks make so much dust that it's sometimes hard to breathe. Anyway, we are apparently here for 2 days as it's a decent rise in altitude at 4400 m so it pushes the acclimatization process a bit faster. We were disappointed to find out there is no bakery here, so no nice cakes and no nice cappuccinos! Today we were told it would take us about 4 hours to get to Tengboche - it meant going from the top of the hill, down to the river and back up the other side. It was a long way down and we moved pretty fast, but going up the other side was strenuous and very slow. Despite that, I did it in about 2 hours which felt pretty good. One very interesting observation as we crossed the river was a destroyed suspension bridge. I took a video of this; it was attached to a huge rock - probably 100 tons or more - perhaps 30-40 feet across, and the river must have undermined the rock as it moved about 40 feet and the entire suspension bridge crashed! I don't know when this happened, but it was clearly a few years ago as a new bridge had been built. We arrived at Tengboche about 11 am and spent the day wandering around - including visiting what is probably the most famous monastery in the valley. This monastery was burned to the ground in 1989 which was a great tragedy for the Sherpa people. We have a very nice room with a view of Mt. Everest - it's really quite unbelievable - I am starting to get an appreciation of the size of this mountain. It's big enough from a distance, but sitting at 3,800 m where we are today (and probably 30 plus km away), I realized that the summit of Everest which I can clearly see from my room, is almost exactly 5 kilometers higher than where I am standing! That seems to me to be a long way, since it is hard enough climbing up 600 m as we did today - I was huffing and puffing and we are only at 3,800 m. I can't imagine how much more difficult is will be to climb 600 m at this high altitude. Actually, I do have some idea of how hard it is so it really makes me appreciate a simple climb even though today, I found it quite challenging going up 600 m. Today I tried to charge my computer from my solar panel and realized there is a small problem - I may have to chop up some cables and jerry-rig up something as I appear to be missing a piece of equipment. I dont know if it is in the barrel that was helicoptered up the mountain, or I just forgot to pack it. I guess I will find out when we arrive at base camp in a few days time. Today we are spending the day in Khumjung  the home of most of the high altitude Sherpas on our team, including the chief Sherpa (or Sirdar) Phurba. We met his family and some of the families of the other Sherpas. This is a famous town in Nepal as it was one of the first places where Sir Edmund Hillary established a school and nearby a hospital. He brought hydro electricity, television and phone services to the local community. The school is spectacular and the first thing you see when you enter the town. It currently goes to 10th grade and this year will increase to the 12th grade. Interestingly, at Namche Bazar, a more commercial town, the school there only goes to the 5th grade. Although we had a rest day we decided that we needed a bit more workout so Bruce Parker my room-mate and myself decided to walk back to Namche Bazar. It took us exactly an hour, despite us taking a wrong track at one stage and we almost went a long way out of our way and in fact had to climb back a fair way. We ended up in the right place at least and went to change some money at the local cyber cafe which was also a money changer and then we spent some time doing e-mails. All their communication is via satellite dishes - and the system crashed about 5 minutes after we arrived so we walked around, had coffee, and then went back and sent some e-mails. We then walked back to Khumjung and on the way dropped in to see the Everest Hotel. I guess it was about a 2 hour walk - maybe a bit longer. It sure slows you down when you start going uphill - we are clearly not well acclimatized yet and sound a bit like puffing billies. Today we spent the morning wandering around Namche Bazar  its an incredible hive of commercial activity - lots of trekkers pass through here every day. Its a famous town in Nepal as almost everyone who approaches Everest from the Nepal side pass through. Its a very beautiful town - lots of inns, a few bakeries, lots of cyber cafes, and many stalls with jewelry and native art. You can also purchase pretty much anything you want for trekking and mountaineering - every famous brand is available all of course genuine if you know what I mean! Today we walked up about 300 meters on a relatively short walk of about 1.5 hours. It was rather fascinating as we walked across an old abandoned airstrip just 15 minutes from Khamjung. Apparently, some 40 years ago, a Japanese consortium decided to build the Everest Hotel on the most magnificent ridge overlooking Mt. Everest. In order to ensure that tourists and trekkers came to the hotel, they built an airstrip and flow some kind of plane onto the mountain and the tourists then walked up to the hotel - a walk of about 30 minutes. Unfortunately, over a few years, all of the planes capable of flying at that height and landing on a short strip, crashed and there were literally no planes left to fly in. Basically, the hotel went broke. It was revamped a few years ago by local Nepalese but they still charge a ridiculous price for a room ($160 per night) which is not exactly a good price compared with lodges that are quite cheap. So its pretty much abandoned again and a real pity as it's a real classic piece of architecture. Khumjung is also the home of our Sirdir (chief Sherpa) Phurba. He has a lodge where we stayed 2 nights. It was very relaxing and we even had power points in the room to charge our cameras! Actually, I think that my room was one of the few that had a power point as most others did not. You could even have a shower there (300 rs) and as we have found in every inn you can buy a coke, beer, water or toilet paper!! Interestingly, there is an outstanding bakery in the town - we went there and had a great cappuccino and apple pie. Almost ever little village seems to have a bakery or two and lots of small shops to keep the trekkers happy. Today we had breakfast at 7am and then trekked from Phakding to the famous Namche Bazar (3,440m). This was a very beautiful trek - it was quite steep with a rise of 600m (2000ft) and thru huge gorges with very long suspension bridges across them. We followed or past many yak-trains carrying all sorts of gear and local produce. Namche Bazar is perhaps one of the most famous places in Nepal. Its small, but a very important commercial site for tourism. I suspect you can purchase anything you want here in the town. We are staying at a very nice lodge and tomorrow we will take it very easy and stroll to Khumjung (3,780m) where we will stay 2 days. We are slowly raising our altitude  getting acclimatized is perhaps the most important thing we do to prepare for Everest. We woke at 4:30am for a 5:15 am departure for the airport at Kathmandu. It was interesting driving through Kathmandu when the streets were basically empty - something you dont see often. We were diverted by a police blockade near the Chinese Embassy - many Free-Tibet protesters. At the airport it was relatively chaotic, this is normal from my past experience. We checked in our luggage and went through security - why they ran all our gear thru an X-ray is anyones guess since they did not stop a single bag and they just put a security checked sticker on each bag. It was really odd! The flight to Lukla (2,840m) is quite something. You fly alongside these enormous mountains all the way. Finally the plane goes into an amazing dive - it heads full throttle toward a cliff face with a runway on the top of the cliff - the runway literally starts at the edge of a cliff and runs about 500 yards up the hill to another large cliff face. Its an experience indeed. From the airport we climbed up the hill to a lodge where we had tea and waited fro the porters to bring our bags where we checked them off to make sure they all arrived. The rest of the day was spent in trekking from Lukla to Phakding (2610m) where we stayed the night. Resting after arriving at Lukla on the fight from Kathmandu. JPR standing just prior to crossing one of the suspension bridges. The runway at Lukla - it just falls off a cliff. I am standing on another cliff at the top end of the runway - if you don't stop voluntarily, you still stop!